SLS opens its doors to Senior High School Students! 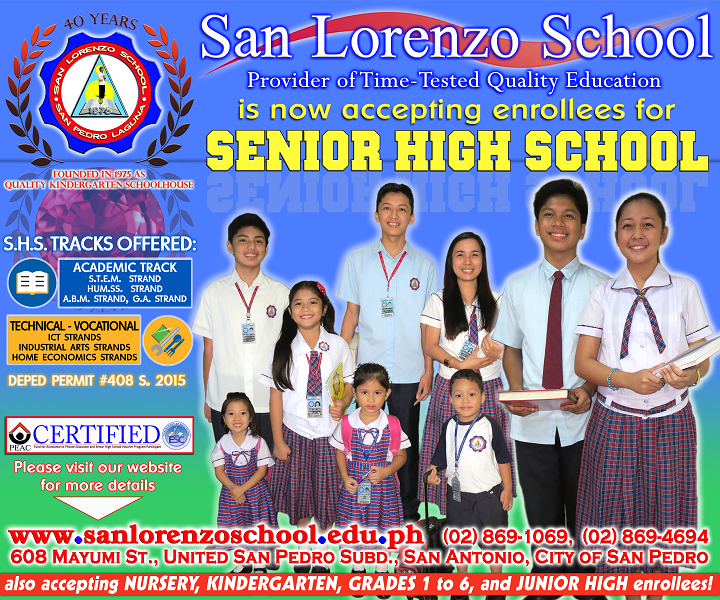 San Lorenzo School is Senior High School Ready! a) Science, Technology, Engineering and Mathematics (STEM) that leads to higher education courses such as Environmental Science, Nuclear Science, Global Health, Medicine, Nursing, Pharmacology, Radiologic Technology, Information Technology, Computer Engineering, Civil Engineering, Architecture, Mathematics, and similar courses. b) Humanities and Social Sciences (HUMSS) that leads to higher education courses such as Education, Arts and Literature, Psychology, Mass Communication, Anthropology, Social Work, International Studies, Political Science, Law, and similar courses. c) Accountancy and Business Management (ABM) that leads to higher education courses such as Accounting, Banking or Finance, Business Management or Administration, Marketing Management, Hotel Restaurant and Institutional Management, Tourism, Human Resource Management, Real Estate Management, and similar courses. a) Home Economics Strands that allow students to complete National Certificate (NC2) courses on Beauty and Nail Care, Hairdressing, Bread and Pastry Production, Cookery, and Dressmaking. c) Industrial Arts Strand that allow students to complete National Certificate (NC2) courses on Electrical Installation and Maintenance. Recently, a Career Talk was held particularly for Grade 10 students by professionals from the Rotary Club of Metro San Pedro who shared their experiences in various fields such as Dentistry, Engineering, Maritime, Education, Real Estate Management, Information Technology, and Accountancy in order to help enlighten and guide the students on the strands they should take based on their ambition. San Lorenzo School, certified by the Private Education Assistance Committee (formerly FAPE), is also a participant of the Senior High School Voucher Program that grants government financial assistance to qualified applicants to avail of private education. The school’s guidance and testing center is open daily during business hours to help accommodate inquiries and interested applicants.